Vestiges of other ancient cultures have the same characteristics! between other places in the world as Egypt, Stonehenge, Japan (Yonaguni), Easter islands and many other Megalithic and Monolithic places, will be explained here. The similarities between places over the whole world are obvious once you know how to look! Atlantis and other disappeared cultures existed and many ancient places are the remnants of those cultures. It is amazing how many old vestiges all over the world, analyzing them from this viewpoint, show these characteristics. We continue to discover more examples. Lately a friend who saw our DVD 'The Cosmogony of the Three Worlds, was visiting the Acropolis with the Parthenon temple on it, in Athens, Greece. 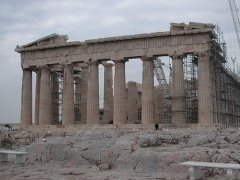 Thanks to the knowledge obtained with the DVD and also because of his trained eyes as an artist (he is a sculptor), he found that the Parthenon is built over a base of Hanan Pacha, the first period as described by Alfredo Gamarra, a time that was considered sacred by the later cultures. See the pictures below. The upper part of the Acropolis, details in the rock as can be found in Cusco. More details in the rock on which the Parthenon was built. Another great place to make comparisons with, is Egypt. On our DVD 'The Cosmogony of the Three Worlds´ we show images where we compare the construction styles with Cusco, where we see the same characteristics. A specialist of culture and history of Egypt and the Pyramids is a french lady called Gigal. 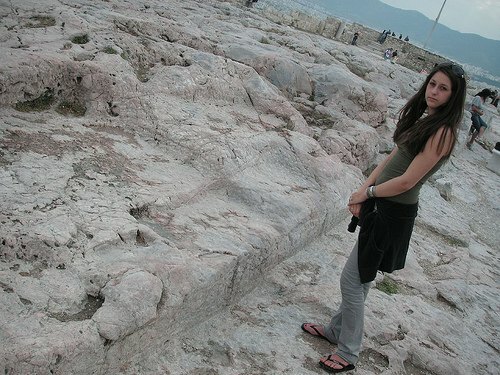 I recommend her website Gigal research, and also welcome her organisation Giza for Humanity, an organisation which wants to unite researchers with different backgrounds, to discuss and exchange information about Giza, and in this way try to reveal the many secrets of the Pyramids and Giza. We met in Amsterdam at the Frontier Symposium and interchanged interesting ideas, and she invited me to be present on the lecture of Giza for Humanity in march 2009 in Paris. Before we met she already saw our documentary, on which she recognized the similarities between Cusco and Egypt. So we already have the same phenomena in Greece and Egypt but on the DVD we show more places as are Malta, Stonehenge, Yonaguni, Turkey, Felsberg in Germany and the Temple Mount in Jerusalem. In 'The Cosmogony of the Three Worlds´ we really proof that similar construction styles can be found in different countries and continents all over the world. To get an even better idea, we have included a video here of Tiahuanaco, the famous vestiges near Lago Titicaca, Bolivia, at almost 4000 meters above sea level in the Andes. It is unedited footage of what we have filmed there, but it will give a good idea about what we want to explain. Detailed images of the magnificent stonework can be seen, details that really give the impression of stone that has been moulded once, and with a finishing under high temperatures, giving as a result the almost metalic shine on many of the stones. 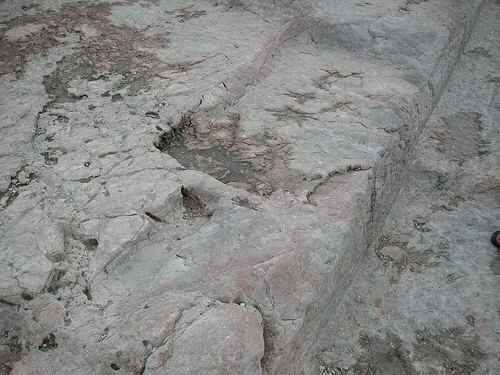 There are still many debates about this site, about it's age, how it was made, if it was once a seaport or not. Here is also included the nearby Puma Punku, where giant pieces of rock are to be seen. Here we find also the 3 styles as in the Inca Vestiges, and the above mentioned characteristics.